Caprio's Hair Studio, HAIR EXTENSIONS in Kingswinford, West Midlands. From beautiful blondes, rich reds and glossy brunettes Great Lengths colour range offers something for everyone. The classic colour range consists of 55 base shades, 17 0f which are various shades of blonde ensuring a flawless fusion. We usually apply a combination of two or more shades to produce a natural result. Also available are great Lengths Flowstrands for a dip dye colour effect and Great Lengths Rooted strands for the root stretch trend so popular at present. We do sometimes also pre-colour the extensions if we feel the colour match isn't exact so we can guarantee a flawless result. For those of you that like the current trend of soft pinks, lilacs, mint greens etc then there's also a range of fashion shades to choose from. We have a team of four extension experts with various levels of experience. Our team are all fully qualified and certified by Great Lengths themselves. You will only ever have an experienced stylist/extensionist applying your extensions. At Caprio’s we use the cold fusion method to apply our hair extensions. This is the BEST application option to apply Great Lengths hair extensions. The bond is wrapped around a small supporting section of hair, and secured in place using a Great Lengths application method. The application process can take between 2 and 4 hours depending on how many individual bonds are required. 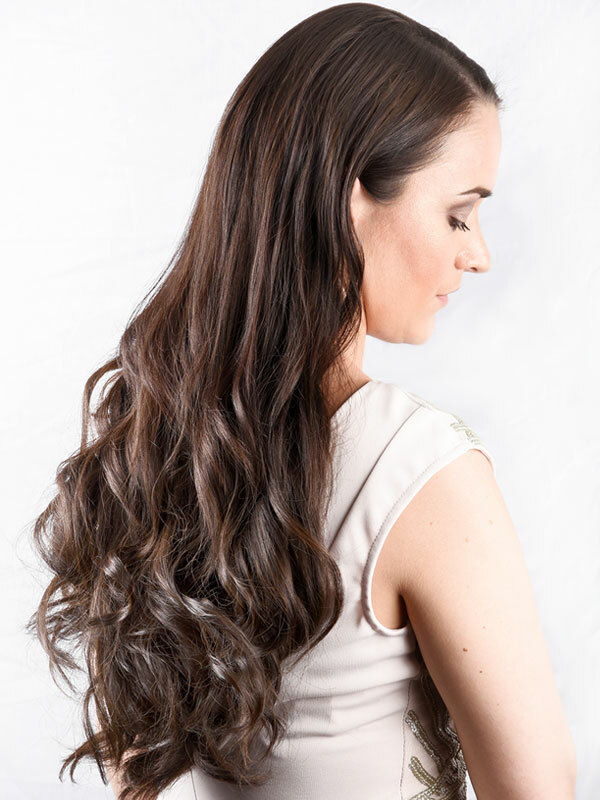 Our team of extension experts will carry out a thorough in depth consultation, explaining everything you need to know on how to maintain and get the best out of your new hair. Once your extension have reached their life span we will remove them for you in salon. You may loose a few during the 1-5 month period you've had them in, this is due to the fact that on average we loose about 100 hair a day. because the extensions are wrapped around your own stands of hair once they are naturally released from the scalp there's nohting for the extension to stay attached too, hence why you may over time loose a few strands. However you will not under any circumstances naturally loose them all which is why we will remove them for you using a gentle solution formulated by Great Lengths to disintegrate the bond. Once we've removed them all we will comb the hair through , cleanse, trim and style your hair in preparation for the next set or not if you'd prefer. There is a small charge for removals as this can take around 2 hours from start to finish.